SASKATCHEWAN, CANADA — Former NFL defensive back, Ronnie Lott, has been named the guest speaker at the University of Saskatchewan’s upcoming Dogs’ Breakfast fundraiser with proceeds going to the Huskies’ football scholarship program. Past fundraisers have raised $1.3 million. The event will be held on April 30, 2015 at Prairieland Park. Tickets can be purchased at www.huskiesfootballfoundation.com. Source: The Star Phoenix. 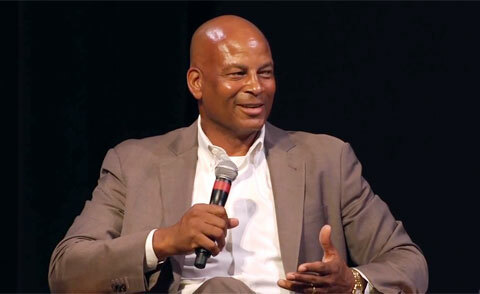 Photo shows Ronnie Lott speaking on Oct. 9, 2014 at Santa Clara University. Lott played for the San Francisco 49ers, Los Angeles Raiders, New York Jets and Kansas City Chiefs for fifteen seasons during the 1980s and 1990s. He was elected into the Pro Football Hall of Fame in 2000, and is widely considered one of the best defensive backs in NFL history. After his retirement, Lott served as an analyst on Fox NFL Sunday in 1996 and 1997, and working on the network’s game coverage in 1998. He is currently on a show called PAC-12 Playbook on the PAC-12 television network. Lott is also a popular motivational speaker. Playing Field Promotions is a booking agent for motivational sports speakers and celebrities. If you would like to book Ronnie Lott for a speaking engagement or personal appearance, contact Ronnie Lott’s booking agent for appearance & speaker fees at 1.800.966.1380.